But total emissions, however, have continued to rise. 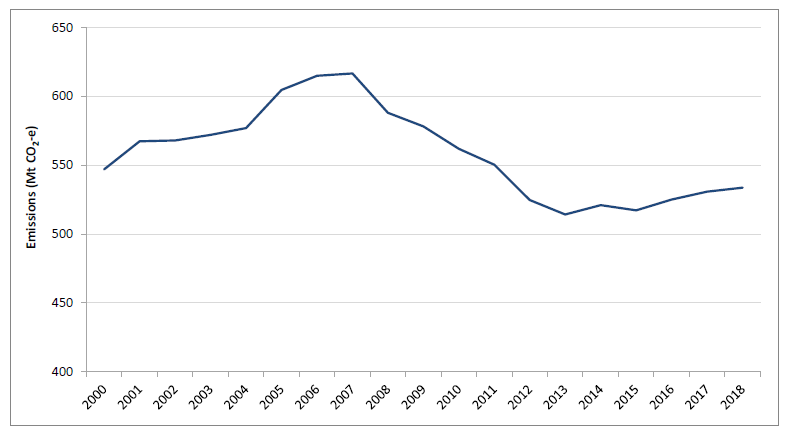 The following figure (p. 40) shows how emissions fell between 2007 (around the time that Kevin Rudd, a former Prime Minister, described climate change as “the great moral challenge of our generation“) and 2013 when Tony Abbot was elected with a promise to abolish carbon pricing, but have steadily increased ever since. According to the ABC, the report was released late last Friday, which was a public holiday in Victoria, the start of a long weekend in three other states (NSW, ACT and SA), just before the NRL and AFL grand finals (major national football codes for anybody outside of Australia), and just after the release of the Interim Report of the banking royal commission. It is hard to believe that the timing of the release was anything but an attempt to bury the news—the Government had received the report nearly 2 months earlier. It’s no wonder they tried to bury it. 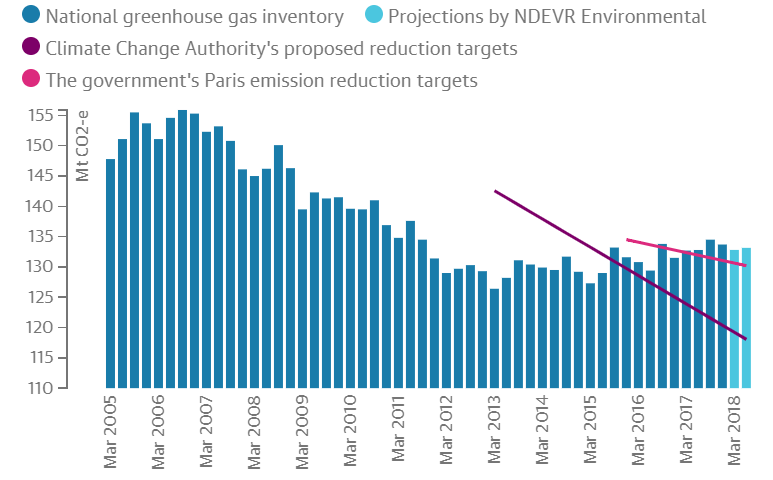 Using unofficial emission figures released by NDEVR Environmental two weeks earlier, the Guardian shows that Australia is well on track to miss the Paris climate targets. 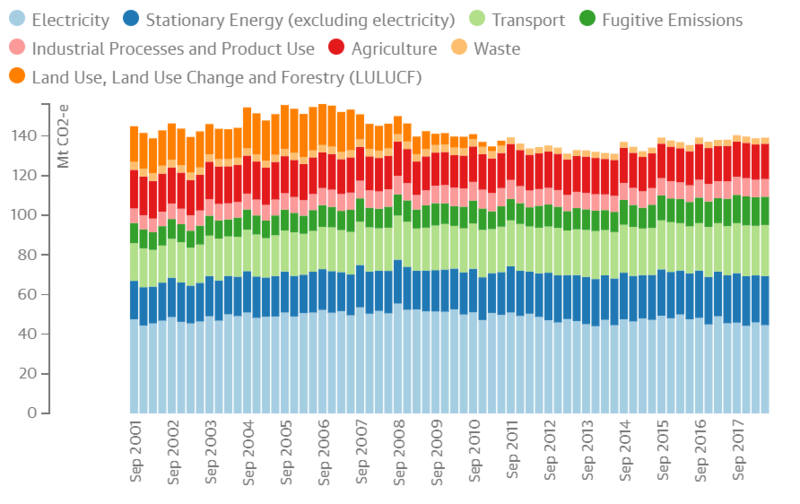 When emissions from land use, land use change and forestry are excluded (which are difficult to estimate and monitor), emissions are the highest since records began in 2002. The Government continues to claim that Australia will meet its Paris targets, ignores or minimises the likely impacts of climate change, refuses to tackle Australia’s reliance on fossil fuels, and has no meaningful policy to reduce CO2 emissions. It is simply not good enough. This entry was posted in Environmental sustainability and tagged Climate change, Environmental sustainability. Bookmark the permalink. I hear, although haven’t confirmed, that the huge electricity demand of bitcoin mining – the creation of crypto-currencies using computers – is likely to mean that this will soon be generating similar levels of emissions to those produced by airline travel. Haven’t heard that one. We live in a sad world.